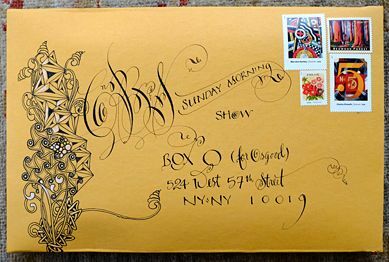 As we promised, this is a quick reminder about sending your Zentangle art to CBS's "Sunday Morning" program. Details and blog link below. 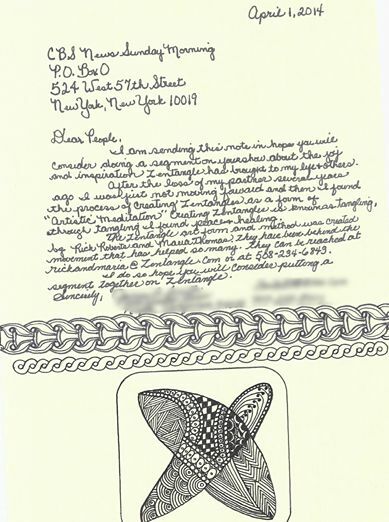 Over the years, we have received so many wonderful letters from passionate people, telling us how creating Zentangle art has benefitted their lives. The stories are amazing and we reread them often thinking them to be so beautiful. It has been our mission from the beginning (almost 10 years ago) to put the Zentangle Method in the hands of as many people as possible, all the while staying true to our original vision of quality and support. During this time, without any advertising and with little retail store exposure, the Zentangle story has spread worldwide. Recently, two of our CZTs, Linda Cobb and Linda Halvorsen, brought to our attention CBS' "Sunday Morning" show. They thought it would be a good fit for sharing the Zentangle story. 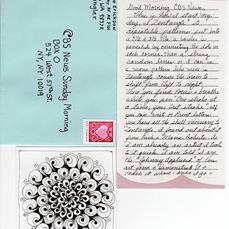 They suggested that if lots of tanglers wrote about their Zentangle experiences at the same time, CBS might choose to do a Zentangle segment. We think it's a fun idea to play with. 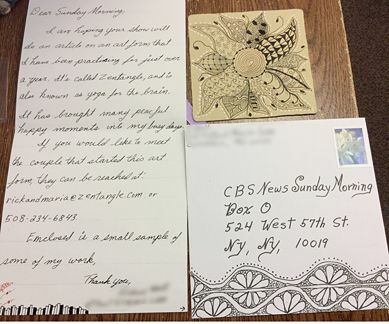 In the spirit of all things Zentangle, we invite you to write a letter to CBS's "Sunday Morning" show, briefly explaining why you feel they should share the Zentangle story with their viewers. Briefly tell them your story about what drawing in a Zentangle way has done for you and ask them to feature the Zentangle story on their show. Keep it personal; don't cite others' claims, just your own. 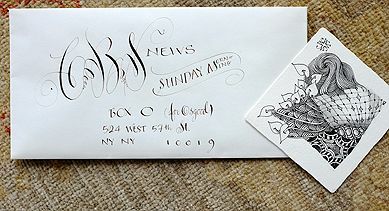 Decorate your envelope as only a tangler can do! Decorate your letter! Tell your story or use just a few words to describe your experience. Whatever you decide to say. 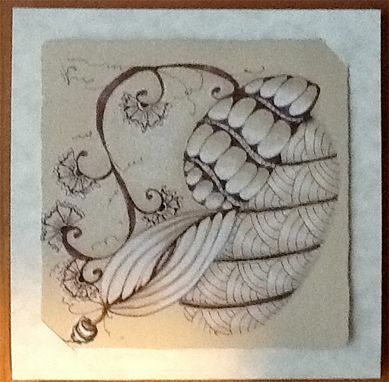 Enclose a 3 1/2" square Zentangle tile . . . an original or a copy cut to 3 1/2"
Include information such as your email, your first name last initial, and how to contact Rick and Maria (rickandmaria@zentangle.com) or 508-234-6843. 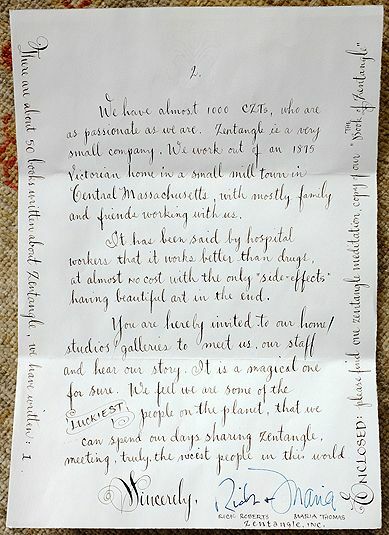 Comment on our blog that we will be publishing on April 1 and share the letter you sent. You can even link to an image of your envelope and tile. Be sure there is a way for us to contact you (by email) because we're going to pick a name (using a random number generator) and give away a framed original Rick and Maria "ZIA" (Zentangle inspired art). We are not sure if this will work, but hey, it's a great way to do a fun project together and maybe win a prize! Thank you all for a most wonderful decade of meeting new friends and sharing our passions and dreams. And special thanks to Linda Cobb and Linda Halvorsen for organizing this effort. 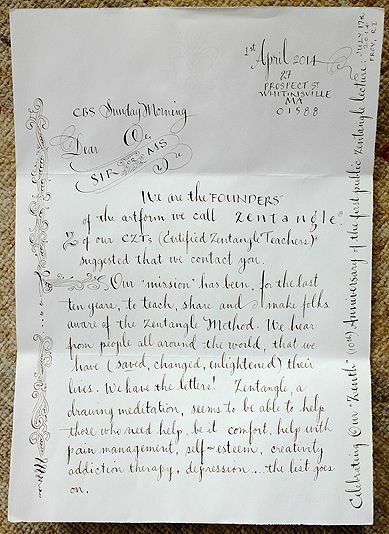 They have been instrumental in similar efforts to bring awareness of the Zentangle Method to many people. We are very grateful to have them in our spectacular bevy of CZTs. Check out this Blog Zentangle link where we'll either post images you send us (rickandmaria@zentangle.com) or, you can link to in the comments section. Here are a few we've already received via email . . .
"The Zentangle method came along for me when I was having difficulty falling asleep and was dealing with chronic daily migraines. Tangling helps calm the brain chatter so I can fall asleep and distracts me from my pain, providing periods of respite. I hope you will invite Maria Thomas & Rick Roberts to share the Zentangle story. You can see larger images of many of these images, and perhaps many more, including yours, on this blog entry. We'll randomly choose a winner from all who send a picture to our email or a link to their picture on our blog entry. We'll announce it in our next newsletter . . .
. . . and include the step out for rixty!